LG has officially launched the V35 ThinQ Signature Edition exclusively for the Korean market. As expected, the device will run customers close to US$1800, but does come with several value-added benefits. Chief among these is a set of Bang and Olufsen Beoplay H9i wireless headphones that normally retail separately for US$500. The device itself is also made from a special scratch resistant zirconium ceramic that distinguishes it from the garden variety version of the LG V35 ThinQ. Customers of the V35 ThinQ Signature Edition will also enjoy a live personal assistant along with premium tailor engravable tailor made leather case. Just 300 examples will be made with 150 in Black and the remaining 150 in White. There are no special internal upgrades with the device powered by a Qualcomm Snapdragon 845 mated to 6 GB of RAM and onboard storage of 256 GB. Display is also the same FullVision OLED panel with a resolution of 2880 x 1440 pixels for a density of 538ppi. Pre-orders for the device have already opened with the V35 ThinQ Signature Edition shipping to customers on August 13. 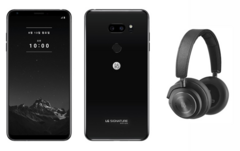 The LG V30 Signature Edition model which was also limited to just 300 units sold out, and there is no reason to think that this model won't do as well. Although the LG G7 ThinQ is supposed to be the flagship smartphone in LG's range, the V35 ThinQ is arguably the better device.